the pink toque. a craft blog: New Album and a Purse!? New Album and a Purse!? So in my last blog post I maybe seemed just a little obsessed (lol, understatement) with my new digital scrapbooking software, My Memories Suite by Polaroid. My obsession only grows stronger and more passionate the more I use it! Last week I finished an 18 page scrapbook of our dogs, Oliver and Winston, and I uploaded the pages to scrapbook.com and to my Flickr account. Compared to the first album that I made with the software back when I got it at Christmas, it's obvious that I've learned a lot by using it more. Once I got the hang of how to use all of the creative options the software has to offer, it only made my final result with my most recent album that much more professional looking. My first album, the Christmas one you can see on scrapbook.com, was mostly me just using the premade layouts that came with the software with very little added input or creativity from my end (mostly because I was just getting the hang of using it.) 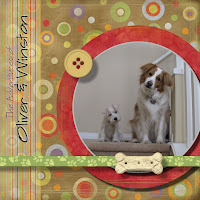 I am proud to say that I personally designed from scratch each and every page of the Oliver & Winston album. As in, I started with a completely blank page and built every detail of every page from the ground up. It of course took a little longer than my first drag and drop album, but it was SO incredibly rewarding! I LOVED the experience and I can't wait to work on our wedding album now. Speaking of the wedding album, I picked up two really awesome sets from ScrapGirls.com in preparation for next month's celebrations. I plan to design the pages with a combination of The Vegas Collection and the Nuptials Collection to create a memorable album of our wedding weekend in Vegas. Look for it sometime at the end of next month after we get back and I've had time to go through all of the digital photography. Only 35 days to go! And be excited because I finally pulled out the sewing machine over the weekend. It was collecting dust in the basement (we still have yet to set up a good crafting area for me down there) but I was in desperate need of a new, summery purse -- thank goodness the beautiful weather lately inspired me -- so I tried something new. The design is new for me and a first for pleating AND using plastic handles that I bought at Michaels instead of making my own from fabric. I was even brave enough to make a little matching zippered makeup bag with the pleat design and mini handle. I think it turned out alright. I'll be sporting this one in Vegas next month and have plans to make a smaller pouch to carry around on the big day from the scraps of my wedding dress that is being hemmed in time for my next fitting appointment. We have so many of the same hobbies--sewing, knitting, etc. I adore your purse, and the dogs... Well, I showed their pics to my Sparky and Mojo who said they were precious. Thanks! 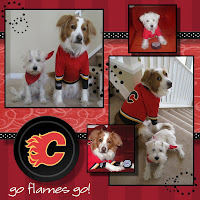 I'm going to go share Sparky and Mojo with my boys because they are just too cute! !